Pleased to have finally finished my Happy Harlequin Shoulder Quilt. It has been a long time in the making. A couple of years ago my other half and I spent a few days driving from Adelaide, via Mount Gambier, along the Great Ocean Road, before leaving the Great Ocean Road at Torquay and heading back home through the Otway ranges. Before we actually made it to the Great Ocean Road, during a stop at Heywood I spied a quilt shop and just had to slowly browse, much to other half’s displeasure, he finds fabric tedious. They had such beautiful fabric but I was particularly taken with the Happy Harlequin range from Fabric Freedom. A fat quarter of each of the fabrics in stock left with me even though I had no idea what design, size or anything else for that matter. After much procrastination, and perusing the templates purchased over years of quilting aspiration and paraphernalia collection, I decided that I’d get the most from my fabric if I used the Westalee adjustable half square triangle template to make random pieces about 4″ (4 inch or about 10 cm). I found the instructions on how to do that easily enough, but found my skills with the rotary cutter left a lot to be desired and that I couldn’t get my squares accurate enough for my liking. And with all the triangles cut, there was no need to keep the selvedges, little did I know. Some time later, after much more procrastination, the achiever won over the perfectionist with a mantra of ‘quantity, not quality’, learn your lessons and get it done. Soon I had a long and rectangular quilt top which would drape beautifully over my shoulders during cold winter nights, but no matching fabric for backing or binding. Some of my joins were perfect and others, not so much. But by now I had no idea what the fabric was called and couldn’t find the details of the shop I had bought it from. I’d already checked all my local quilt shops so I knew they didn’t have any and had been browsing for something else to use, but nothing appealed. The lady at one of my local quilt shops took one look at the top and said ‘that needs an orange backing’. But nothing was quite the right fit. After many hours spent over several nights trawling through images of fabric online, one morning I had a light bulb moment, perhaps, one of the lovely ladies from the Facebook Quilting Group I had joined would recognise the fabric? A quick photo and plea for info and 10 minutes later I had the name and manufacturer. A few more minutes and another member told me she was pretty sure they still had some at work. By lunch time I had ordered my backing, yes, in orange and binding. Yeahy. It was meant to be. The quilting was a little difficult because my uneven seams were creating havoc, but the size was manageable, so I only quilted lightly on the bias. 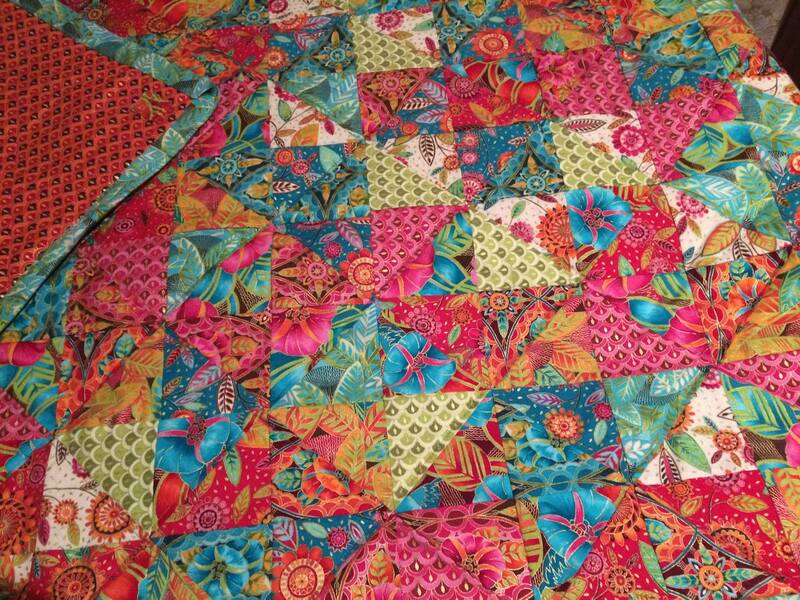 I wondered about quilting internal squares but decided against it because a, the fabric was so colourful the quilting would probably get lost and b, I really didn’t want to end up with too many tucks on the back. Perhaps next time. Snip seam ends on the diagonal so that they don’t bulk up joins. Imperfections fade as the quilt comes together.